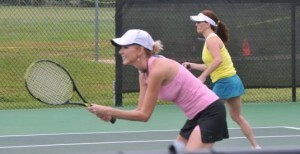 Aces Against Aneurysms, an initiative started by aneurysm survivor Rebecca Winchell, has scheduled its 5th annual Ladies tennis tournament for Monday, April 28, 2014 at Pelican Athletic Club in Mandeville. Proceeds from the tournament will fund aneurysm medical research. Cost of entering the tournament is $50 and participants must register by April 18 by contacting Barbara Fisher at bfisher@thepac.com. This year, Winchell has launched a new 501 (C) 3 nonprofit, Brain Support NOLA, brainsupportnola.com, to support aneurysm awareness. Winchell survived a potentially deadly brain hemorrhage as a result of an aneurysm four years ago and made a promise to raise awareness in the area. Last year’s tournament raised over $12,000, which was donated to the National Brain Aneurysm Foundation’s research fund. An aneurysm is an abnormal widening of an artery. A bulging sac forms and can burst, resulting in massive bleeding in the brain. People are typically born with aneurysms and it sometimes takes forty to fifty years before causing problems. Or it may never cause problems. • Fainting or loss of consciousness. The purpose of the tennis tournament is to raise funds for aneurysm research and education in the local community. To register for the tournament, contact Barbara Fisher at bfisher@thepac.com before April 18. Check back frequently or check our facebook page for updates and details on reserving your spot!